Comment: This part of the Abraham story is troubling for adults to hear, but even more so for children. Abraham is upheld as an exemplar of a strong faith. He had such a deep faith in God, that despite not being able to see the big picture, he puts all his trust into God even if that means he will offer his son for a sacrifice. I think we need to address the plot line of the story with children and not jump straight to the happy ever after ending. For a moment, Abraham, Isaac and even us don’t know it is going to end the way it does. We are on the edge of our seats waiting and hoping God will jump in. In Wishful Thinking: A Seeker’s ABC, Frederick Buechner describes faith as ͞a journey without maps.͟(30) He writes, “Faith is not being sure where you’re going, but going anyway.͟” (30) This describes Abraham perfectly in this moment. We first meet Abraham in this passage at the bottom of the mountain as he is beginning a journey to sacrifice his son at God’s command. We get to listen in on the conversation between father and son, and we can hear the pain Abraham has as well as his deep faith. 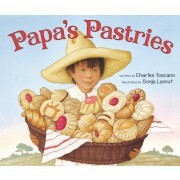 In Papa’s Pastries, Miguel’s parents are struggling to provide food, shelter, and clothing for the family. Miguel’s Papa is a baker, and he travels from village to village selling his pastries. One morning he uses the last of his firewood to bake the pastries, and while they bake he prays to God asking for blessing for the day and prosperity. Papa and Miguel begin their travels for the day. At each of the villages, Papa interacts and enjoys the village people, but when it comes time to sell his pastries, everyone says times are tough and they can’t afford them. And in each village,Papa gives pastries to one family. Papa and Miguel arrive home empty handed, and Mama is concerned about not having money to provide for their family. Papa responds ͞that kindness is far more valuable than money. Everyone goesto bed that night a little concerned, but in the morning something amazing happens. Each of the people Papa had given pastries to have a skill they want to share. One is a carpenter, one a woodcutter and another a seamstress. In the end, all of their needs are met. This story,read in connection with our Old Testament passage, reminds us that God provides in the ways we least expect or can’t see in our moments of need. Abraham wanted a way out of the difficult task he had been given and Papa wanted to provide for his family. In the end, both received what they needed and wanted. It wont always be easy. Papa and Abraham hold onto their faith in God – their trust in God to take care of them and their hope in God’s love for them – despite the mountains they were facing. Comment: Every day we get a chance to choose how we are going to live. Do we choose to live with God and strive to bring about the kingdom, or do we choose to live without God? Paul is reminding he church in Rome that they belong to God and are now free from sin and death. They have the opportunity to live with God under grace. Paul is reminding them that because they belong to God, they need to choose to act in a way that shows the world they belong to God. We have to be ourselves and we are God’s children. Tinker Bell learned this lesson the hard way. More than anything Tinker Bell wanted to go to the mainland, so she tried to learn how to do the job of a nature fairy. Everything she tried turned into a big mess. It was only when she accepted that she was a tinker fairy was she able to create something beautiful. And in the end, she was able to go to the mainland because of the work she did as a tinker fairy. We are faced with the decision to be people of God or people of the world every day. When we choose to be people of God, our lives will create beautiful things that honor God. It is who we were meant to be. Comment: A simple act of welcoming someone goes farther than we can imagine. When we stop and welcome someone into our lives, we open ourselves up to new relationships, to being changed, and great memories. These are not things that can be taken away either. Jesus tells his disciples at the end of this chapter, preparing them to go out into the world sharing the good news, that if they are welcomed, there will be a reward. The reward comes from encountering the Good News through their interaction with the disciples. Gerald and Piggie have a tough decision to make. They are playing catch one day when Snake comes and ask to play catch with them. Elephant and Piggie look at each other and make the decision to welcome him in to the game. Now Snake doesn’t have arms and this leads to a hilarious story as these three try to figure out how to play catch with no arms. After some trying, Gerald and Piggie must decide if they want to keep playing catch or keep playing with Snake and adapting what they are doing. They choose to include Snake in an out of the box way. Gerald, Piggie, and Snake have been changed by their interaction with each other. What began as a simple choice to welcome someone in,turned into a relationship. Thanks to Elizabeth Boulware Landes, Associate Pastor for Children’s Ministry and a graduate of Union Presbyterian Seminary, for writing the Revised Common Lectionary Links this week. Lectionary Links (RCL): July 2, 2017 by Storypath is licensed under a Creative Commons Attribution-NonCommercial 4.0 International License.